Preface. 1. Convolution. Introduction. 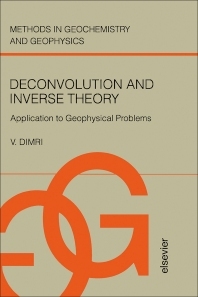 Convolution in geophysics. Fourier theory. Geophysical convolution model. 2. Deconvolution. Introduction. Predictive deconvolution. Time-varying deconvolution. Homomorphic deconvolution. Minimum entropy deconvolution. 3. Inverse Theory. Introduction. Linearized inversion. Nonlinear inversion. Types of norms. 4. Inversion and Deconvolution. Introduction. Deconvolution and inversion. Multichannel constrained Wiener filter. Discussion. 5. Inversion of Reflection Seismic Data. Introduction. Seismic reflection method. Inversion methods. Migration. Seismic tomography. Ocean acoustic tomography. Stochastic tomography. 6. Inversion of Other Geophysical Data. Introduction. Inversion of gravity data. Inversion of magnetic data. Inversion of resistivity data. Inversion of electromagnetic data. Joint and cooperative inversion. 7. Deconvolution of Other Geophysical Data. Introduction. Estimation of density. Optimum filter for potential field data. Modified Wiener-Hopf equation. Nonstationarity of magnetic data. Kalman approach. Deconvolution of resistivity data. Deconvolution of paleomagnetic data. 8. Spectral Estimation. Introduction. Overview of conventional methods. High resolution methods. Multichannel and multidimensional spectra. Appendix A. Multichannel Unimodular Constrained Filter. References. Subject Index. This is the first study to present simultaneously both deconvolution and inversion, two powerful tools of data analysis. Featured within this volume are various geophysical convolution models and a treatment of deconvolution for a time-varying signal. The single channel time-varying deconvolution is shown equivalent to the multichannel time-invariant deconvolution, thus a formalism and associated algorithms can handle both. Inverse theory as well as various inversion schemes are presented on the basis of a relationship between a small perturbation to the model and its effects on the observation. The information theory inversion scheme is discussed, and several types of norm of minimization presented. Additionally, concepts and results of inverse theory are applied to design a new deconvolution operator for estimating magnetization and density distribution, and the constraint of the Backus-Gilbert formalism of inverse theory is used to design a new prediction error filter for maximum entropy spectral estimates. Maximum likelihood, another high resolution method is also presented. This volume can be utilised as a graduate-level text for courses in Geophysics. Some chapters will be of use for graduate courses in Applied Mathematics, Applied Statistics, and Oceanography.